Summary: The answer to the biggest question lays inside the heart. The question is what is the biggest gift in the whole world . With the gift of the world, there are melodies of joy, wonder and laughter, uplifting smiles that tenderly and warmly brighten our lives. The world offers opportunities for fellowship and loving families. Travel makes possible the discovery of the wonder that the world has to offer. Nature is a miracle that waits to be discovered; the plants, seas, and all the creatures big and small living in it, snowy mountains and sunshine, all inspire the endless possibilities for painting. The world is really a gift. Literary Elements at work in the story: The book is divided into two sections both ending in the middle of the book. On one side “You are the gift to the world” and on the other side “The world is the gift”. Each part of the book opens with the memory of the question as if it were a dialogue between two individuals. But it remains unclear to know who is asking the question, and to who? Although the illustrations show two peoples and adult and a girl enjoying the time together as family, still between the two of them nothing indicates who is speaking. The adventurous exploration of the gift of the world has no indication of racial or cultural connotation; however, it takes a good economic status to travel around the world and take advantage of what the world has to offer. (How) does the perspective on gender/race/culture/economics/ability make a difference to the story? The author emphasizes the concept of gift. To be a gift to the world or the world to be a gift to us gives no indication of race or economic status but it is itself a culture in the sense it is a call for responsibility toward the world. Where does your biggest gift come from? How responsible are you toward the biggest gift? How do you show your gratitude for having the world as a gift? What makes think you are a gift to the world, and the world a gift to you? This review was written by Union Presbyterian Seminary student Bahekelwa Imatha. 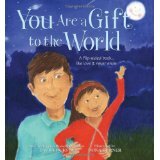 You Are a Gift to the World by Storypath is licensed under a Creative Commons Attribution-NonCommercial 4.0 International License.